ALL DONE UP: Emily, a sales rep for SunnyCountry radio in Santa Maria, kept Jono’s attention while putting on his clown mask. It was a puzzling moment when the captain of our editorial team, Managing Editor and Lead Cat Herder Ashley Schwellenbach, dispatched me to attend Rodeo Clown U at the Santa Maria Elks Lodge. I wasn’t sure how to take it—did she think that I really belonged in a ring, wearing face paint and colorful clothes, running around with 2,000-pound animals, jumping into barrels and over tall metal gates? Did she actually consider me a worthy opponent to duck and dodge the athletic beasts in order to protect the brave (and perhaps a bit crazy) men and women attempting to hold on for the longest eight seconds of their lives? Or was it a ploy to get rid of me? As the days passed and my destiny quickly approached, she got a little sheepish, even asking if they were really going to put me in a ring with a bull (because that would be a great idea). “I’ll be the only bull in that ring!” was my response, a half-hearted joke attempting to displace worry. And alas, I was wrong. Then, my courage was put to the test over pizza and a bit of comedy. What I found was a posse of people fully up for the job. The May 27 shindig was a lead-up to the Santa Maria Elks Rodeo & Parade, held at the fairgrounds May 29 to June 1, where the pros will come out to test their skill, strength, and sturdiness. At Clown U, also known as Media Clown School (no offense taken), members from local media, including KSBY, Santa Maria Times, MEGA 97.1, Spanish-language radio stations La Buena Radio and Radio Laser, and others gathered to get the rundown from rodeo clown and entertainer extraordinaire Frankie “Punkintown” Smith. Because those at the Elks Lodge are civilized folk, no bulls were allowed; however, Punkintown was plenty to keep our attention focused and our feet moving. “We in the rodeo feel that we are one of the last true family entertainment sports,” he told the class. After explaining rodeo’s origins, when cowboys would bet on who could last the longest on that horse that just won’t be tamed, he got into a plug about how well rodeo animals are treated. It seemed to be both out of pride in his craft and to buck criticisms from animal rights groups. 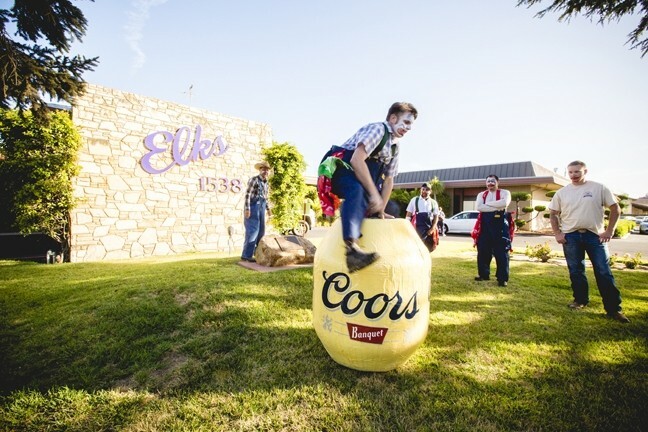 ROLL ’EM OUT: During Rodeo Clown University, students got to (try to) hop into Professor Punkintown’s own personal barrel, which he had custom made by a man in Idaho. Rodeo animals get the finest feed around—their handlers are very specific about the size and variety of feed, and insist on fresh water. Really, aside from a little kicking around, these bulls and horses are treated like royalty. Good bucking animals can be worth anywhere from $25,000 to $150,000, at least. For years the animals have been bred to buck, and the breeding is so successful that every so often an animal comes around that is too strong and too smart to stay in the ring. “If the bull breeding don’t slow down we’re gonna have to start breeding cowboys that can ride these bulls,” Punkintown said. Punkintown told stories of his meetings with notorious bulls. One particularly close encounter came about after jumping into his signature Coors Original barrel while slapping the bull in the face. The bull nudged the barrel on its side and stuck its head into the hole, bringing the two face to face. The bull then picked up the barrel—which got stuck on its head—and ran around the ring for a while. The two parted after the bull got some fingers jammed in its nose, and the rest was a fuzzy memory. As for Rodeo Clown U, we had it easy. After hearing the stories, I was all too happy to jump into Punkintown’s barrel and go for a roll—amidst the safety and comfort of the Elks’ front lawn. Our teacher was not only an entertainer, he’s a man who’s easy to place your trust in. That’s vital for a rodeo clown, because when the bull riders go down, the clowns jump into the ring to keep their comrades safe and alive. As for Rodeo Clown U’s Class of 2014, I don’t feel shy speaking for most of us in saying that, aside from helping the kids with the Muttin’ Bustin’, we’d very much prefer to stay on the other side of the steel gates wearing our press passes, watching the pros do their job—because I ain’t no barrel man. Contact staff writer Jono Kinkade at jkinkade@newtimesslo.com, or find him ringside Sunday, June 1, where he’ll be wearing the journalist hat, having left the rodeo clown hat on a hook at home.